The Supermarine S.5 is prepared for racing at the Schneider Cup. On this date in 1927, RAF pilot Flight Lieutenant O. E. Worsley took the first flight in Britain’s newly constructed entry to the Schneider Cup, the Supermarine S.5 racer. 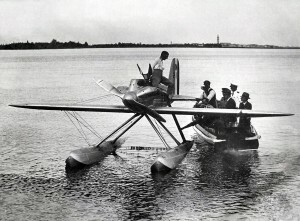 The Italians, having achieved victory in 1925, had set the race date for September 1927 and Supermarine had undertaken extraordinary efforts to produce a winning seaplane racer. The weather on June 7, 1927, was ideal and wave conditions were fitting for the aircraft’s first flight off the coast at Suffolk, England. 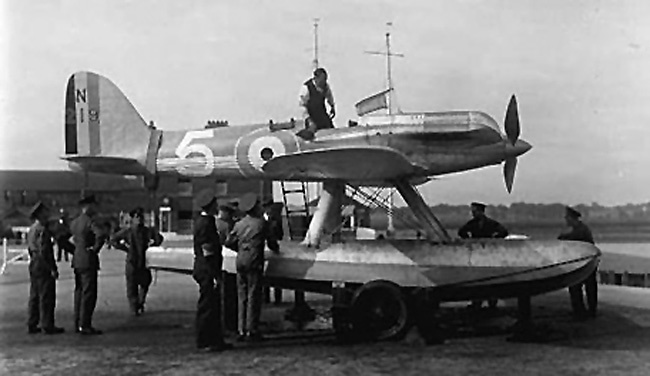 Flight Lieutenant Worsley, one of the members of the small team of RAF pilots of the High Speed Flight (a racing team specially gathered to compete in the Schneider Cup races), taxied the aircraft out onto the water. After a series of tests, he advanced the power to the airplane’s direct drive 900 hp Napier Lion VIIA engine. If past races were any indication, the key to victory would be in the engine, even more than the airplane’s design. Reliability at maximum power settings would count above all other things. The S.5′s narrow fuselage was designed to gracefully wrap around the engine’s front profile and sides. It then tapered back smoothly to the tail. The cylinders and rocker arms were encased in fairings that protruded from the top and sides of the aircraft. It was a tightly-designed craft that literally wrapped tightly around the pilot. The wings and floats were carefully contoured to connect with a minimum of added drag. The tail was a classic Reginald Mitchell design, a man who would later apply his experience from the races to the design of Britain’s premiere fighter plane, the Spitfire. The S.5 overall plan was based on the S.4, which had competed in Virginia against the Americans and Italians. While the S.4 had sported an all wood fuselage, tail and wings, the S.5 was a revolutionary step ahead for Supermarine. This was the company’s first all-metal monoplane racer with a semi-monocoque fuselage made of duralumin. The advantages of the metal design were measured in greater speed and lesser weight. At Suffolk that day, the plane performed well. The engineers and maintenance teams would go to work perfecting the design based on continuing flight tests, seeking to add more and more speed. Even the fuel was a radical new mixture, pioneered by Flight Commander Bates, who had been experimenting with increased octanes through benzine fuel additives. By August, the planes would be disassembled and placed aboard a ship for the trip to Italy, crossing through the Straits of Gibraltar. 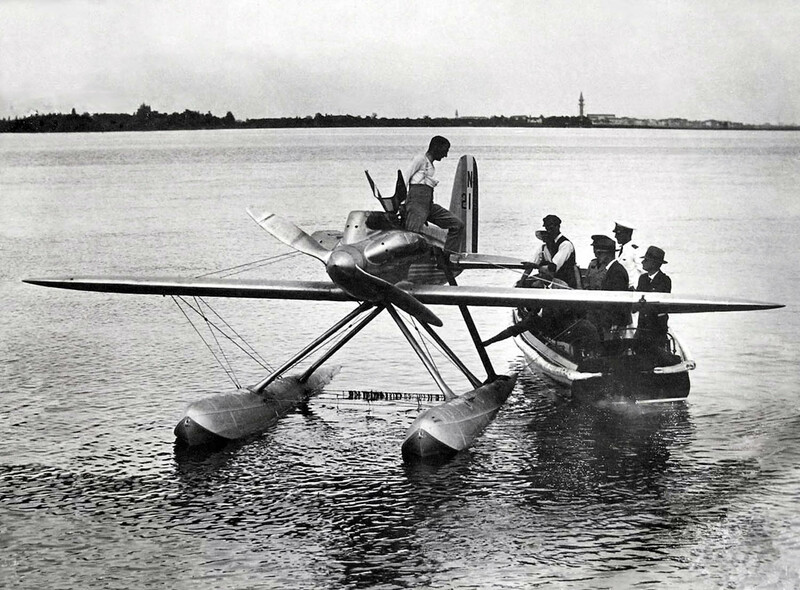 Just three months after the first test flight, of which nearly a month was spent in shipment to Italy, the S.5 would make its appearance at Venice for the races off the beaches of the Lido. Other British entries included the Gloster IV (a Napier Lion-powered biplane) and the Short Crusader, which featured a Mercury 9-cylinder radial engine that was derated to 810 hp (having been bench-tested to 960 hp). The latter had proven slower in pre-race testing and was not expected to be as competitive. The Italians came with their latest design that was created by Mario Castoldi, designer of the 1926 winner, the Macchi M.39. Their new aircraft was called the Macchi MC.52. The races were a dangerous affair and every aircraft was engineered to the limits of each nation’s ability. The risks of such cutting edge engineering were seen on race day, when the two S.5 racers took first and second place, while the Italians never finished due to engine trouble. As for the Short Crusader, it was never put to the test after it crashed during a first test flight. Afterward, the investigation revealed that the aileron cables were accidentally reversed when the plane was reassembled in Italy after being shipped over. Thus, as the plane slightly banked at liftoff from the water, the pilot’s corrective input instead caused the plane to roll further until it struck a wingtip on the waves and crashed. The plane hit the water at 150 mph and snapped in twain at cockpit. The pilot, Flying Officer H.M. Schofield, was thrown clear and rescued by a nearby boater who dove into the water to save the unconscious man from drowning. Of the two S.5s (serial numbers N219 and N220), the winning aircraft (N220) was flown by Flight Lieutenant S. N. Webster at an average speed of 281.66 mph. Flight Lieutenant Worsley would fly N219 to a 2nd place finish, clocking in a speed measured at 272.91 mph. Although the Macchi M.52s did not finish, just two months later, the Italian racing pilot Major Mario de Bernardi proved the design by taking one of the M.52s up to set a new world speed record at 297.8 mph, which was achieved over a 1.9 mile course off the same Lido beach at Venice. With the victory of the S.5s, the races were moved to England — and Reginald Mitchell went to work on his newest design, the Supermarine S.6. My dad’s step-sister Winifred worked at Selfridges or Harrods and was taken out by Oswald, a Kensington resident on several occasions, but met and fell for his older brother. Eric, a rather dapper navy man. Eric worked immediately before WW2 as a draughtsman at the Experimental Bridging Establishment, Christchurch. Hants, the home of the Bailey Bridge. On a couple of occasions my father rode on his fixed wheel bicycle from Acton, West London, to where they lived in Avenue Road, Christchurch. After a sandwich and a cup of tea he would ride back there. The couple had a son who became a Doctor in the Army and retired as a Brigadier. Aunt Freda and Uncle Eric lived for a few years in the top floor flat of our house after they had retired from running the New Queen Pub at Avon on the A338. Aunt Freda showed me the replica Schneider Trophy which had been awarded to Oswald as well as a model of the S5 N219. Sadly Oswald had died 18.10. 1930. I was told he had a car crash.